Alison Nastasi -- who has already shared with us those memorable reviews of Hard Target and Near Dark -- returns for Day 3 of the Lance Henriksen Blogathon with a terrific review (at The Pineal Eye) of another Henriksen horror classic, 1991's The Pit and the Pendulum. From the first moment he appears on screen, Henriksen’s Torquemada has us utterly transfixed. 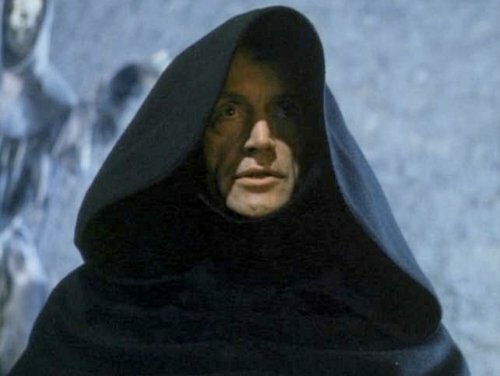 The actor spends 97 minutes mostly shrouded in dark robes. His slender hands wave hypnotically through the air, as though he were conducting some kind of silent, demonic orchestra. A scene where the Inquisitor surrenders to a whipping by one of his underlings demonstrates the actor’s parallel commitment to preparing for the role of the sadistic General. Henriksen’s upcoming biography, Not Bad for a Human, details the ascetic lifestyle that he underwent to immerse himself in his character. Director Stuart Gordon also comments on the “fearsome presence” Henriksen became on set. This is another insightful review from Alison, so make certain to check it out. "Fine look at the film, Alison. This one is a wicked little number by Stuart Gordon. The Oliver Reed casting is brilliant (and a sly nod to his work in Ken Russell’s The Devils). Add Jeffrey Combs in with Mr. Henriksen and you have one mischievous and naughty mix that’s so much fun. Thanks for this." I agree with everything you wrote, my friend. Alison has been sending us great contributions each and every day.